on the woodside. : *which came first? OK, universe, I hear ya! It is not asparagus season any longer. Unfortunately, I'm stubbornly stubborn, and this was the only dinner idea I had in my head—I don't have the luxury of thousands of post-work hours to be brainstorming and creating, so I did the requisite two trips to grocery stores to track down the elusive stalks. And you can see the success was only slight—these are some decidedly peaked and sagging asparagus spears. The thicker ones at my Publix were all cracked and dried out, so I went with the pencil-thin variety, hoping they'd stay alive long enough for me to get them roasted. Which they did, but I humbly admit that I have learned my lesson: No more asparagus until spring, scout's honor. But here I did want the eggs to come out silky and soft and smooth, less "scrambled" than "coddled." That called for a little half-and-half and a naughty knob of butter. You want them to come together slowly, so it's best to employ a technique I learned from my old friend Gordon Ramsay: Put your pan over determined heat, but move it off and onto the heat source as things come together, letting the eggs cook with residual heat when possible. That will keep things smooth and creamy and guarantee that you don't overcook! 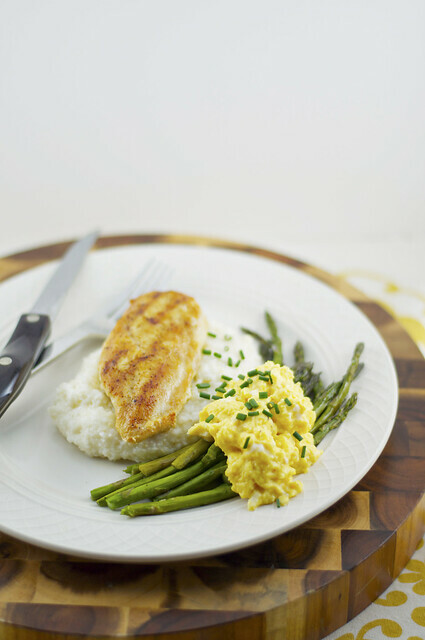 The chicken here is no rocket science—just lightly pounded out, sprinkled with your favorite seasoning (I used Tony Chachere's because that's what was in the pantry), seared in a grill pan, and finished off in the oven while the asparagus roasts. Easy peasy. For someone who set out here with something slightly less than a plan, per se, this turned out to be something of a surprise, because everything was on the table in less than 30 minutes. That is what we call serendipity. One question, though: Serving a meal with both chicken and eggs ... creepy or delicious? 1. Preheat oven to 400 degrees. Sprinkle chicken breasts evenly with Cajun seasoning on both sides. Place asparagus on a baking sheet; drizzle with olive oil, and season with salt and pepper to taste, tossing to coat. Brush grill pan with olive oil and heat over medium-high until hot. Add chicken; cook 2 minutes on each side or until golden brown. Remove chicken to a separate baking sheet. Roast chicken and asparagus 20 minutes or until asparagus is tender and chicken is cooked through. 2. Meanwhile, cook grits according to package directions. Stir in cheese and kosher salt to taste; cover, and keep warm. 3. Whisk together eggs and sriracha in a medium bowl. Melt butter in a medium saucepan over medium heat; add egg mixture, cream cheese, and half-and-half. Cook, stirring constantly, moving pan on and off the heat as necessary, until eggs are just cooked but not set. (Do not overcook.) 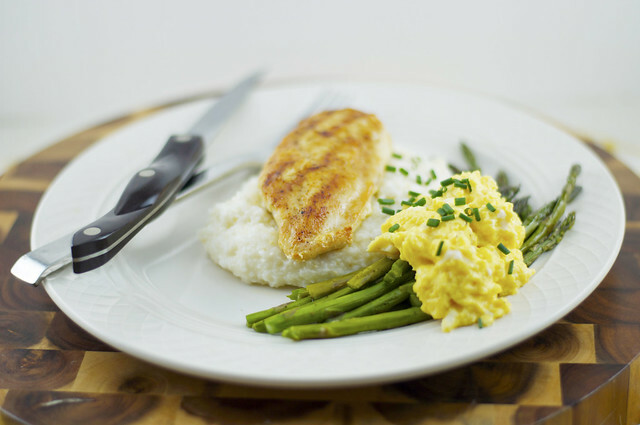 Serve grits topped with chicken; spoon eggs over asparagus. Garnish, if desired. Makes 4 servings.